1960s: Aircraft lands on runway. hd01:33CIRCA 1960s - 1960s - Battle footage of U.S. 1st Infantry Big Red One troops fighting battles on the battlefield in the Vietnam War. hd02:00CIRCA 1943 - Footage shot from a B-17 captures other planes and many beautiful cloud formations. hd01:21CIRCA 1980 - The Air Force Reserve readiness exercise Readout 80 is successfully completed. hd01:00CIRCA 1960 - The arsenal of the contemporary US Army is compared to that of the past. hd01:03CIRCA 1940s - Evasive action is taken by the bombers after dropping their payload. hd01:07CIRCA 1950 - Trads amphibious vehicle is tested in the Korean War. 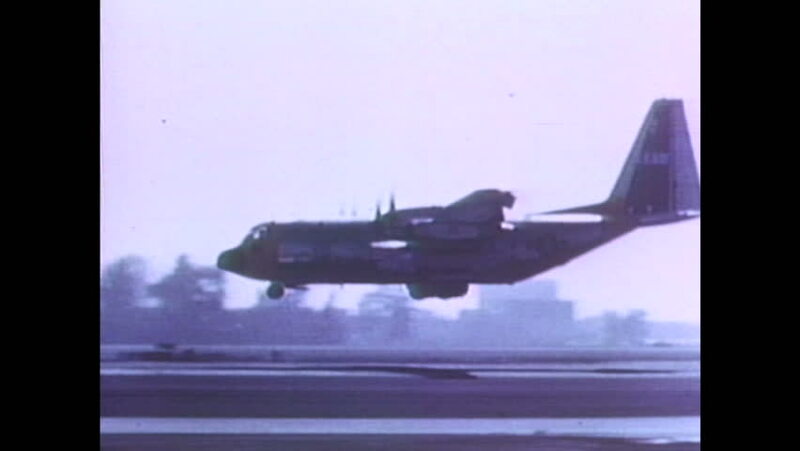 hd00:35CIRCA 1965 - A USAF plane lands on an airstrip in Vietnam, as filmed from another plane also landing. hd00:201940s: View of plane flying. Man in gun turret. Aerial view of countryside. Gun fires from plane. Puffs of smoke in sky.